A young woman cries bitterly. She tells Thozama Lande how her husband beat her and chased her out of their house. 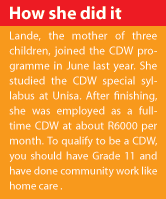 She fled from the Itereleng informal settlement in Pretoria, and got help at the Laudium Community Centre from thozama who is a Community Development Worker (CDW). Thozama listened to her story. She contacted social workers, the ward councilor and others to open a case, arrange shelter for her, and provide other aid. As a CDW, Lande sees about 50 people a day with different problems ranging from abuse to applying for ID’s and grants. The CDW programmes were started after President Thabo Mbeki, in his 2003 state of nation address, asked people to help government identify gaps in service delivery in communities. CDWs were sent in to communities to identify needs and bring these to government. They have relationships with municipalities, non-government organisations, ward councilors, government departments and community structures. “We work with communities where I do door-to-door calls. During Imbizos, we tell government about poor services. “During disasters like shack fires we also call for help from government and other organisations,” said Lande who quit teaching to be a CDW. When Vuk’uzenzele met with Lande, she was on her way to Itireleng settlement to register people for government’s food parcels. Chief Director of the CDW Unit in the Public Service and Administration (PSA) Ministry Emmanuel Kgomo said the department of local government funded the programme, but the PSA ran it. He said it was also supported by South African Government Association and Local Government Sector Education and Training (LGSETA). The National Skills Fund gave R70million for learnerships and R4million was from LGSETA to train mentors.